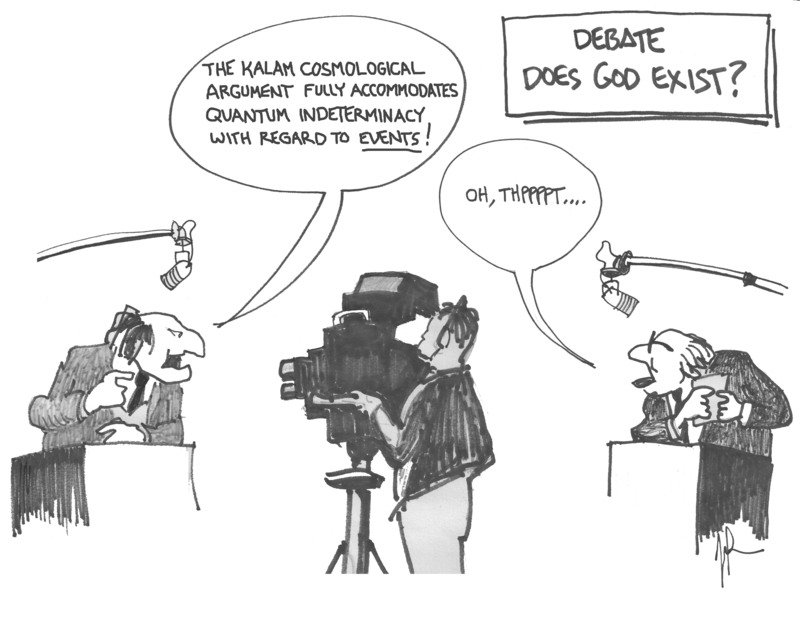 Believe it or not, formal debates on the existence of God regularly turn out thousands of ticket-buying intellectuals to hear atheists and theists go at it. Although it may seem silly to give out medals for something every kindergartener should know, there is much to appreciate in well-turned arguments that support the affirmative. Here’s a full-on “Does God Exist” debate between Dr. Craig and Dr. Peter Atkins. Why adopt an intellectual approach? After all, can’t we just fulfill the Great Commission by living a good life and introducing others to the Bible? Sometimes we have to meet people where they are, and often they refuse to accept biblical arguments. Christians contend that Christianity is reasonable, and therefore science, logic, and philosophy are all in play. But is the juice worth the squeeze? The intellectual approach is hard work. Why not invest a couple of hours studying these arguments, put them in your apologetics tackle box, and try them out when the fish aren’t biting? This entry was posted on Saturday, September 29th, 2012 at 2:52 pm	and tagged with atheism, Christianity, Does God Exist, Theism, theology, veracity, William Lane Craig and posted in Apologetics. You can follow any responses to this entry through the RSS 2.0 feed.